The Car GuideTests and FeaturesTest Drives2012 Lincoln Navigator: Any bigger and it would bite you! 2012 Lincoln Navigator: Any bigger and it would bite you! As automobile journalists, we get the chance to drive almost everything on the road. After a few years, going from a smart to a Porsche or from a Ford F150 to a Toyota Corolla loses its lustre. However, when I recently got behind the wheel of a Lincoln Navigator, I was quite frankly intimidated. This vehicle is not just big, it’s enormous! And we were driving the short version: there’s an L (for Long) version that extends the vehicle by 379 mm (15 inches). The Lincoln Navigator is the luxury equivalent of the Ford Expedition. The two cousins – “twins” is more like it – share the same mechanics but the Lincoln offers more comfort, luxury and accessories. In 1997, when the time came to replace the Bronco, Ford wanted a vehicle that would interest people in construction and families wanting to travel with children, uncles, aunts, grandma, the dog, the cat and all their baggage. This colossal vehicle is now in its third generation, bigger and heavier than ever, in a world where a mere kilo saved becomes the centre of an ad campaign. Also: How Much is the 2015 Lincoln Navigator Worth? The Navigator’s chassis comes from the F-150 pick-up, as do its mechanical components. Except that the F-150 has evolved and now has more modern engines. The Navigator isn’t as lucky and is still powered by the ancient 5.4-litre V8. Undoubtedly designed back when Cro-Magnon man was trying his hand at cave drawings, this engine is not very refined and consumes like Niagara Falls. Over our week-long test drive, our average fuel consumption was 16.0 L/100 km, which was a very pleasant surprise. However, it must be said that we took it easy with the accelerator, didn’t haul a trailer or other heavy loads and didn’t drive in 4x4 mode. Speaking of 4x4, the Navigator’s system promises solid off-road capabilities. The transfer case’s low gear range (Lo) isn’t as reduced as that of a Jeep Wrangler, for example, but it’s reduced enough to get itself out of some pretty deep mud. In fact, as is often the case, the tires’ traction limit will be reached long before the limit of the 4x4 system. Unfortunately, the suspension is not height adjustable since it isn’t pneumatic, which would give it precious additional millimetres of ground clearance. If you’re into that kind of thing, the aforementioned ground clearance is 23.4 cm while both the approach angle and departure angle are 21.8 degrees. The breakover angle is 19.2 degrees. These figures are for the regular Navigator. American buyers also get a rear-wheel drive version, but in Canada, only the 4x4 is offered: an excellent decision. Performance-wise, the Navigator handles itself pretty well, with a 0-100 km/hr time of less than 10 seconds and a sound that only a good old American V8 can produce. Obviously, continuously trying to go 100 km/hr in less than ten seconds is neither very green nor very economical. Bring on the 3.5-litre V6 EcoBoost! The six-speed automatic transmission may not shift very quickly but at least it’s quite smooth. This gearbox includes a Tow/Haul mode that helps shift more rapidly in the first gears when pulling a trailer of a maximum of 3,900 kilos (8,600 pounds). While we’re on the subject of towing, note that the big rearview mirrors are extremely practical for everyday driving, but they’re likely to be insufficient once you’re pulling a trailer. Ford doesn’t appear to offer extendible rearview mirrors like those available on option on the F-150. However, the running boards that lower every time you open a door are an endless source of “wow” and “now I’ve seen everything”. Many people have expressed reservations about the mechanism’s reliability in winter once the running boards are covered in icy mud. To try to recreate this situation, I blocked the path of the running board, which quietly returned to its place once it ran into the obstacle. So, I don’t imagine there will be any problems in winter. Once you’ve made it inside, a task made much more simple by the power-deployable running boards, you’ll be impressed by the sheer size of the interior. Seven or eight people, depending on the version, can sit comfortably and even transport a few personal effects, and that’s just in the regular version. The L version, which is 379 mm longer, has a very large trunk. In front, the dashboard is impressive, although several of its commands and gauges, the quality of some of the plastics and the lack of a foot rest are relics of a bygone era. 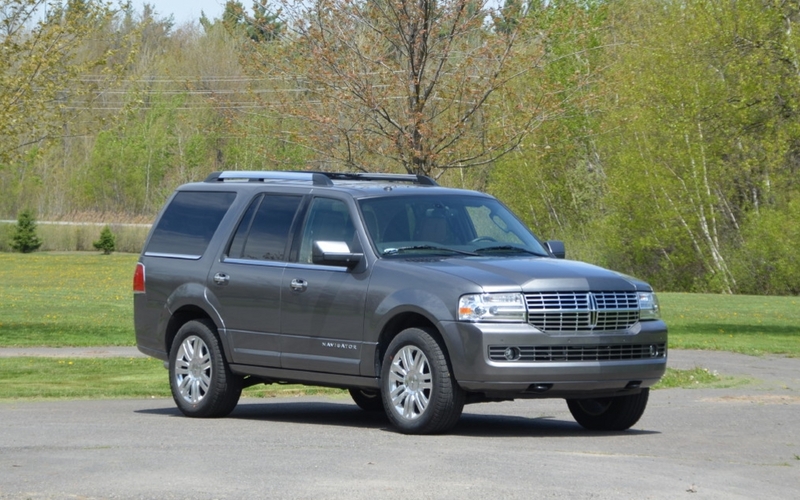 What’s more, in “our” $75,000-Navigator Limited, there was no smart key, no Start/Stop button, no telescopic steering column, very few storage spaces (the glove compartment is ridiculously small for such a big vehicle) and a finish that isn’t even close to what Ford is doing these days. At least the seats are comfortable, regardless of their position in the passenger compartment. As for actually driving the Navigator, the handling isn’t exceptional, but not terrible either. The steering lacks precision and feedback, the soft suspensions promote comfort and cause an often pronounced roll in turns, but overall, and if you respect the laws of physics, the mastodon’s ride turns out to be reassuring. Fortunately, the brakes are very powerful since they have to work excessively hard to stop this mass of more than 2,700 kilos. Is it time for a diet? The Lincoln Navigator and Ford Expedition are moving throwbacks, but if Ford is still offering them, it’s because there’s still a demand for this type of vehicle, albeit a steadily diminishing demand. More importantly, the demand is a lot less than for the Chevrolet Tahoe and Suburban. As it’s a very modern vehicle, I hope that the F-150 might serve as the basis for the next Navigator, if there is one. I hope so, because for travelling with the family, only a minivan can top it, provided that you don’t have to tow too heavy a load and you don’t have to go off the beaten track.